HARRISBURG — Kennel owners told a House committee Thursday that a proposed overhaul of commercial dog laws in Pennsylvania would go too far. “We don’t support a bill that makes it easy to criminalize largely law-abiding people,” said Rob Sexton, vice president of government affairs for the U.S. Sportsmen’s Alliance, which includes members who raise hunting dogs. Proposed criminal and civil penalties of up to $1,000 against violators are too steep, Sexton said. Read the rest on Pittsburgh Live. Image courtesy. How about a front-page, double byline on the cover of today’s Pittsburgh Tribune-Review? How about two? Rally coverage from yesterday for today’s Pittsburgh Tribune-Review. HARRISBURG — As the Pennsylvania General Assembly plunges into its annual budget negotiations, state Rep. Daryl Metcalfe is focusing on what is becoming his signature concern: immigration reform. Read the rest on Pittsburgh Live here. Image from previous rally in Philadelphia, courtesy Diggers Realm. HARRISBURG — The cost of the planned North Shore casino continues to rise and owner Don Barden still does not have enough money in place to finish construction, his spokesman said this morning. Read more on Pittsburgh Live. Image courtesy. 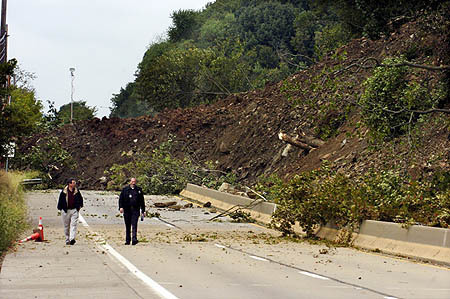 HARRISBURG — The state Department of Environmental Protection would need to approve excavation in geologically sensitive areas, under legislation recommended Monday by a legislative panel in response to the September 2006 Kilbuck landslide. A developer was working on the site of the former Dixmont State Hospital when the slide dumped 500,000 cubic yards of debris onto Route 65, snarling traffic for two weeks and disrupting interstate train travel on adjacent tracks for days. Wal-Mart, which planned a superstore at the site, has abandoned plans to develop the property and is working to stabilize the site. The landslide apparently occurred because of slide-prone geological conditions and blasting the day before, according to a report issued by the panel. Filed for the Pittsburgh Tribune Review. HARRISBURG — Tolling Pennsylvania’s portion of Interstate 80 would create an “economic Chernobyl” in areas along the interstate, a Bloomsburg businessman said. Paul Eyerly, president of Press Enterprises, was one of the two dozen people who rallied at the state Capitol Monday to oppose tolling I-80. “We’re going to drive people away from Pennsylvania,” state Sen. John Eichelberger, R-Altoona, said. A few of the rally’s 25 attendees attacked Act 44 — a transportation funding law from last July that would institute I-80 tolls. The groups, including truckers, cited congestion and loss of business as reasons to repeal Act 44. Under Act 44, I-80 tolls would help raise nearly $1 billion annually for transportation infrastructure. Lawmakers would need to find a funding source if Act 44 is overturned. The federal government hasn’t approved tolling the interstate. See it on Pittsburgh Live. Take a break from state property taxes, the state smoking ban proposal and Philadelphia exemption for a moment and enjoy some good old vandalism. HARRISBURG — The phone and power lines were cut in the district office of state Rep. Jim Marshall, R-Beaver, just before 4 a.m. today. Kane found the office’s electrical box on the ground near the rear employee entrance when she arrived at 8:20 this morning. It was confirmed by the office’s phone service provider that service was cut at 3:47 a.m., Kane said. Nothing was taken and police found no evidence of forced entry, she said. By 10:30 power was returned and by noon all office activities had resumed. Police noted a string of burglary attempts over the past two weeks in the area and the office’s alarm could have scared those involved, Kane said. Read it on Pittsburgh Live. Photo courtesy of Ironic Sans. I covered a Pennsylvania House-Senate conference committee hearing on a statewide smoking ban this morning for the Pittsburgh Tribune Review. It marks a laborious, 10-month joint effort to find compromise between a state Senate and more restrictive state House bill. Stewart Greenleaf, R-Montgomery, made note of the long process. Hear Greenleaf speak on a statewide ban last month.